Direct Response Copywriter on AIDA. Part 4: Action. In the last few emails, I talked about the first three parts of AIDA: attention, interest, and desire. Now it’s time to discuss the “A” … action. Take a look at advertisements in the branding world and you rarely see any type of call to action. Take a Budweiser ad, for example. You watch the ad then the ad ends. Nobody says to you, "go into your local convenience store or supermarket and buy Budweiser." But in the world of direct response, action is vital because action is a vital part of ... well ... DIRECT RESPONSE. A response, by definition, requires action. But there's more to action to the direct response copywriter than simply organizing a "buy now" button or including a phone number. In physics, we learned "for every action, there is an equal or opposite reaction." Or something like that! It's somewhat the same in direct response copywriting. For every person thinking about taking the action you'd like them to take, there are 10 people who don't want to take the action, even though they might really like the product or service. They have objections. These range from "it's too expensive" to "it's the wrong color" to "I don't know these people." One of my jobs as a direct response copywriter is to find these objections then address them. Why? So the person on the fence takes the action I'd like them to take. Here are some other ways to overcome objections. Different ways to respond, if possible. A free sample, if there's a soft offer. I also like to TELL the prospect what to do next. 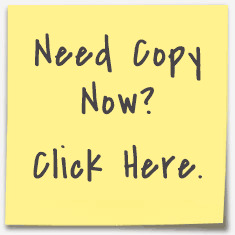 I see a lot of copy that leaves out the "5 steps to take now" and related copy. Everything must be super-clear in copy, especially the steps you want people to take. A lot of companies just assume that people will know what to do next. I never make this assumption. When I worked in a store seeling outdoor equipment, I was really good at helping people get interested in something. I was even better at moving them to the cash register and buying. I would find their objections, overcome any, and simply say, "are you ready to buy this?" Direct Response Copywriter on AIDA. Part 3: Desire. In the last couple of emails, I talked about the first two parts of AIDA: attention and interest. Now it’s time to discuss the “D” … Desire. But they’re not thinking, “I have to have to have Driver A.” To create DESIRE for Driver A, I have to link the desires of the golfer to the product. Here’s where bullets and research come in. I research Driver A so I can reveal to the golfer exactly how Driver A will help them reach their golf goals. It could be the design of the driver, its adjustability, the shaft, etc. Then I have to provide proof to back up the claims I make about the technology and design. When a direct response copywriter gets this right, the potential client has desire for the product or service. Again, here’s where a long list of bullets are so important. In the information marketing space, it’s easier to create this desire. The key? The use of fascinations. Direct Response Copywriter on AIDA. Part 2. In the last blog, I wrote about the first part of AIDA. Let's review what AIDA stands for. If I've been successful then I have the attention of the reader. Now it's time to keep the attention of the reader by being interesting. It's not easy to be interesting in copy. I like to think about the reader sitting in front of my copy going, "WOW! I never knew that!" If I'm writing golf copy then I like to write about a new way of solving a common golf problem. Golfers typically find this type of content extremely interesting. Here's where the research comes in. I like to find facts that tie back to the benefits that really appeal to the potential customer. I was watching a VSL the other day. The VSL was for a subscription to an investment newsletter. The "big idea" the direct response copywriter used was to reveal how to profit from stocks that would rise and fall based on wars. After getting the attention of the reader, the copywriter wrote extensively about 10 different wars that could start in the next five years ... and why. It's brilliant copywriting. The copywriter keeps the interest of the viewer. Most of the viewers are interested in global conflicts but probably didn't know about all these potential wars. It's also a way of proving the link between conflicts and the opportunity for profit. Again ... research is so extremely vital here. Fascinating facts come from this research. The research must focus on what's interesting to the potential customer ... and it must also relate to the product or service. Of course, every piece of direct response copy has to be fascinating from beginning to end. But there's a point in the promotion, usually right after the introduction or headline where the interest level has to increase dramatically. Let's go back to a hyper-successful magazine like Cosmopolitan Magazine. The headlines on the cover get the attention of the reader. Then the articles are interesting because they reveal things the reader doesn't know ... but wants to know. Would articles about golf be valuable to the Cosmo reader? NO! Would articles about how to dress to attract men be valuable in Golf Digest? Negatory big brother. The fascinating facts must be salient. In the next blog, I'll talk about the "D" part ... DESIRE. Anyone can find interesting facts. But it's only the skilled direct response copywriter who knows how to find the interesting information that's relevant to what the potential customer really wants.